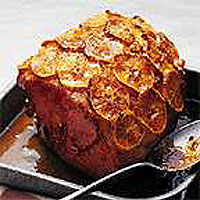 Waitrose British gammon joints make a perfect centrepiece to the festive table. Mix together the sugar and five spice powder and the rind and juice of the clementine. Place the gammon in a roasting tin. Score the skin and rub in the spice mixture. Cover with foil, sealing well. Cook in a preheated oven 180°C, gas mark 4 allowing 55 minutes per kg, plus an extra 25 minutes. Remove from the oven and drain off any juices and reserve. Cut away the string and the skin. For the glaze: finely chop 2 or 3 pieces of the ginger and place in a small saucepan with 4tbsp of the ginger syrup, the juice of half a clementine, the marmalade, the mustard and 3tbsp of the cooking juices. Bring to the boil and cook for 5 minutes or until thick and syrupy. Brush two thirds of the glaze over the gammon. Thinly slice the remaining one and a half clementines and arrange over the glaze, if necessary hold in place with cocktail sticks. Brush the remaining glaze over the sliced fruit. Return to the oven and increase the temperature to 220°C, gas mark 7 for about 20 minutes, basting occasionally until the glaze has set and the clementines have just started to brown around the edges. Remove from the oven and serve either hot or cold with seasonal salads, potatoes or as part of a centre piece for Boxing Day lunch.